The topic of hydraulic fracturing (also known as fracking or hydrofracturing) and its potential effects on groundwater have dominated recent water news nationwide, but especially in the areas of the nation where fracking is practiced. As evidence mounts that the practice is an impending environmental disaster, there is no indication that efforts to curb fracking or to at least postpone it for further study have even the slightest chance of succeeding. Fracking has been carried out virtually without regulation, thanks to the US Energy Policy Act signed into law in 2005 in the Bush/Cheney pro-drilling era. The Energy Policy Act fully exempted the oil and gas industry from the provisions of the Clean Water Act, the Safe Drinking Water Act, the Clean Air Act, the Resource Conservation and Recovery Act and the Comprehensive Environmental Response, Compensation and Liability Act. In other words, the EPA and other government regulatory agencies have no real oversight authority where fracking is concerned. The following description of the fracking procedure is excerpted from an interview with Marianne R. Metzger of National Testing Laboratories that apppeared in Water Quality Products magazine (July, 2012). Hydraulic fracturing, usually called fracking, is a process used to remove natural gas from shale deposits. Fracking is done by drilling a well down several hundred feet, then drilling horizontally, often for several hundred feet. Special fracking materials, mostly water but also a blend of chemicals and a sand-like substance called proppant, are then pumped into the well under pressure. This special fracking solution permeates the cracks, the proppant sets up to hold the cracks open, and natural gas can then rise to the surface. Although a well casing is in place where the borehole passes through the water table, the act of opening these small cracks will eventually allow naturally occurring contaminants like methane, usually the first to be noticed, to migrate into the aquifer. Methane sometimes gets to aquifers naturally, but fracking speeds the process up. It only makes sense that cracks that can carry natural gas can carry a variety of water contaminants as well. 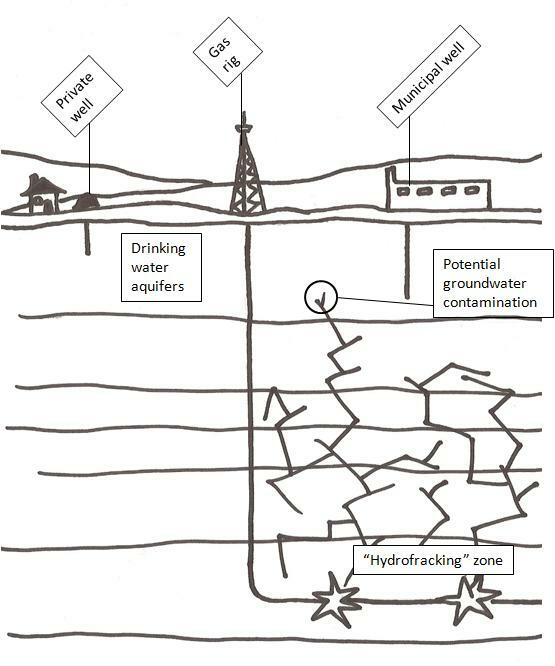 Earthquakes have been associated with fracking, especially where deep wells are used to dispose of fracking wastes, though no specific cause and effect relationship has been established. Air pollution has also been a problem in the areas surrounding drilling sites.